1. The Centre’s weak finances may force it to defer the implementation of the One Rank, One Pension (OROP) scheme for the armed forces to the next fiscal year. 2. Under OROP, a uniform pension will be paid to armed forces personnel, who retire at the same rank after the same length of service, regardless of their date of retirement. Additionally, the government announced that these benefits would be given retrospectively from July 1, 2014, with arrears to be paid in four half-yearly installments, with pensions re-fixed every five years. All of that adds to costs, and it is causing govt to pause for thought. 3. The OROP scheme will add to the government’s fiscal burden due to a higher pension outgo. It estimated that the one-off hit due to arrears could be Rs 10,000-Rs 12,000 crore in FY16, if the scheme is implemented this year. The recurring annual additional cost will be in the region of Rs 8,000-RS 10,000 crore, and could increase in the future after pay structure is revised based on the award of 7th Pay Commission. The Pay Commission report, which is due by December end, would reset the salaries and pensions of central government employees. 4. With a potentially lower divestment proceed (possibly half of the target of Rs 69,500 crore) and an anticipated shortfall in tax collections of about Rs 50,000 crore putting the FY16 fiscal deficit goal of 3.9% of GDP difficult, the government seems to have made up its mind to shift OROP implementation to next year. 5. The government is yet to set up a one-member judicial committee to examine the interests of retirees of different periods, different ranks and address inter-service issues of the three armed forces for OROP. The panel is supposed to give its report in six months. Tall, lanky, cheerful and confident, Esmatullah easily engages his young students at the Street Kids School, a project of Kabul’s “Afghan Peace Volunteers,” an antiwar community with a focus on service to the poor. Esmatullah teaches child laborers to read. He feels particularly motivated to teach at the Street Kids School because, as he puts it, “I was once one of these children.” Esmatullah began working to support his family when he was 9 years old. Now, at age 18, he is catching up: he has reached the tenth grade, takes pride in having learned English well enough to teach a course in a local academy, and knows that his family appreciates his dedicated, hard work. When Esmatullah was nine, the Taliban came to his house looking for his older brother. Esmatullah’s father wouldn’t divulge information they wanted. The Taliban then tortured his father by beating his feet so severely that he has never walked since. Esmatullah’s dad, now 48, had never learnt to read or write; there are no jobs for him. For the past decade, Esmatullah has been the family’s main breadwinner, having begun to work, at age nine, in a mechanics workshop. He would attend school in the early morning hours, but at 11:00 a.m., he would start his workday with the mechanics, continuing to work until nightfall. During winter months, he worked full time, earning 50 Afghanis each week, a sum he always gave his mother to buy bread. Now, thinking back on his experiences as a child laborer, Esmatullah has second thoughts. “As I grew up, I saw that it was not good to work as a child and miss many lessons in school. Pakistan Prime Minister Nawaz Sharif may not have secured much from during his United States visit beyond a reference to the Kashmir dispute with India in the joint statement and another on “tensions with India,” but he has posed a difficult choice to the world on Afghanistan. He has asked the world community to decide for itself whether he should ‘kill’ the Afghan Taliban, or facilitate their talks with the government in Kabul. 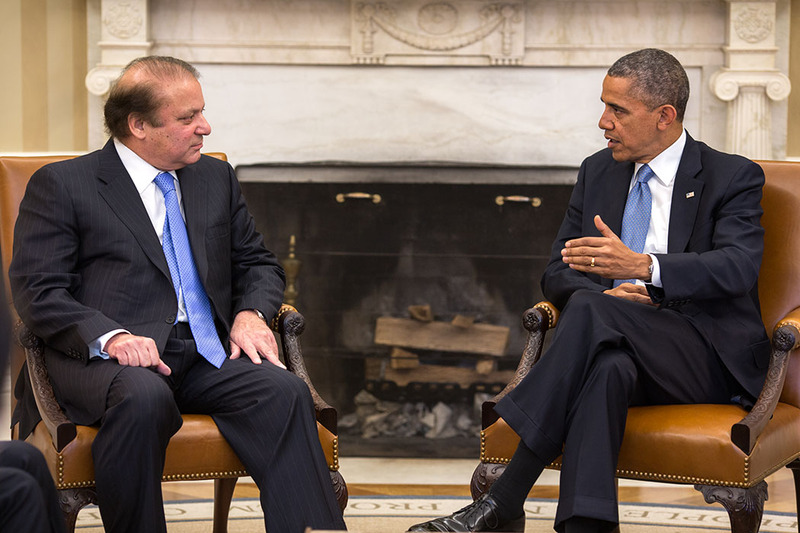 Pakistan “cannot bring them to the table and be asked to kill them at the same time”, Sharif stated after his meeting with US President Barack Obama. It is Hobson’s Choice for the world community as the US, the most significant player in the region, is widely perceived as losing interest and yielding space to China, a strong Pakistan ally, after having withdrawn much of the NATO forces from Afghanistan.  Is Pakistan on its way to becoming the first country to defeat a large scale Islamist insurgency? In 1990, three colonels were inducted into the Pakistani army’s planning cell for Kashmir, the Himalayan territory at the heart of its conflicts with neighbouring India. Tasked with assessing the ramifications of the withdrawal the year before of Soviet forces from Afghanistan, the three men recommended the mujahideen, or holy warriors, returning home after inflicting defeat on the Red Army should be disarmed. They also recommended the militants be prevented from getting involved in – and radicalising – Pakistan’s Kashmir campaign. Their recommendations went ignored and the consequences were catastrophic. “There were strong voices inside the military against any culpability with terrorists, because it ruined the legitimacy of the Kashmir struggle,” one of the three colonels, Mahmud Shah, tells The World Weekly. Regional integrity seems a distant dream for South-Asian nations, at least when it involves what is known as Track 1 or “official” diplomacy. Three decades have passed since the South Asian Association for Regional Cooperation (SAARC) was established with theaspiration of bridging the gaps between South Asian countries, while providing them with a platform to discuss regional issues and come up with practical solutions. Unfortunately, SAARC has proven to be a lethargic platform that has been able to bring close neighbors together, let alone more distant ones. Political grudges, blame games, and a deficit of trust have consistently proven to be stumbling blocks to regional integration. Rivalries among states instill negative thoughts in the minds of naïve citizens as well. Conflicts among the states are rarely limited to the government level; they sow the seeds of hate in the hearts and minds of citizens as well. South Asian countries have been pushed many times by external powers to set aside their political grudges and strive for peace and prosperity in the region. All such nudges have been in vain. But rarely have external powers been motivated to try initiating people-to-people contact as an alternative path to regional unity and connectivity. People-to-people contact or “public diplomacy” remains the unfulfilled agenda of SAARC. U.S. Secretary of State John Kerry is set to be the latest high-profile visitor making the rounds in Central Asia later this week. Kerry will touch down in Bishkek on Thursday, after a stop Wednesday in Vienna for talks on the ongoing Syrian crisis. Visits to Samarkand, Astana, Dushanbe, and Ashgabat fill out the remainder of the trip, ending on November 3. Kerry will be the first U.S. secretary of state to visit all five Central Asian republics in one trip. He is not, however, the region’s first high-profile visitor this year. Central Asia, a region often neglected in international media, has nonetheless been the focus of a series of global diplomatic overtures. In June, UN Secretary-GeneralBan Ki-moon traveled to all five former Soviet republics. In July, Indian Prime Minister Narendra Modi made the trip and Japanese Prime Minister Shinzo Abe just concluded his grand tour of the region. Last year, South Korean President Park Geun-hye visited Kazakhstan, Uzbekistan and Turkmenistan. Chinese President Xi Jinping has made multiple trips to the region over the years, usually scheduled to coincide with the annual Shanghai Cooperation Organization (SCO) heads of state summit. 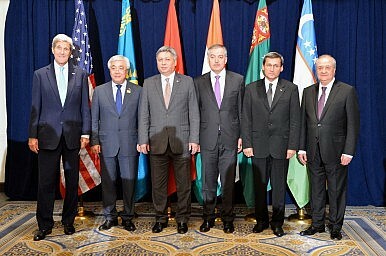 China, along with Russia, Kazakhstan, Kyrgyzstan, Uzbekistan and Tajikistan, is part of the SCO, which rotates it summits among the members. In 2013, Xi visited Kyrgyzstan–the summit host–as well as Kazakhstan, Uzbekistan and Turkmenistan. The following year, Xi visited Tajikistan. One of India’s gravest security threat is the far-left Maoist militant movement. Part 2 of our series on Maoism elaborates on the party structure of the Communist Party of India (Maoist). Russia and China: Beware the Budding Eurasian Colossus? Could these two great powers get even closer? As Russia’s unexpected military intervention in Syria has dominated headlinesacross the globe in recent weeks, more than a few media outlets have speculated on whether Chinese forces could enter the fray. While that particular “twist” on the story remains extremely unlikely, the question is not entirely outlandish. After all, it was only a few months ago that a Chinese naval squadron was in the Black Sea exercising with the Russian fleet. Moreover, the Chinese Navy’s profile has been steadily rising in the Middle East as it sent its first flotilla into the Persian Gulf in the fall of 2014, has also conducted competent evacuation operations in Yemen in 2014 and Libya in 2011, while the PLA Navy maintains its continuous anti-piracy patrols in the Gulf of Aden as well. Major foreign and defense policy dilemmas await Beijing as it continues to plot out the future of its “one road, one belt” – China’s own strategic “pivot” to the west. 'There are major implications for India. Though there was a transparently thin attempt to project the troop reduction as intended to promote peace, the downsizing is actually part of plans to streamline and strengthen the PLA, capable of defending China's national interests at home and abroad,' says Jayadev Ranade. Chinese President Xi Jinping's Announcement at the grand military parade on September 3 that China's People's Liberation Army would be downsized by 300,000 personnel signalled the beginning of extensive reform and restructuring of the PLA. Described by Chinese officials as the most extensive and far-reaching ever, the military reforms will be carefully studied and monitored in many world capitals. The impact of these military reforms, which are intended to boost China's ability to achieve its regional ambitions, will be felt mainly by countries in China's neighbourhood and those with whom China shares a land or maritime frontier. The once fearsome Islamic State group, also known by the acronym ISIS, has fallen off the front pages. The big news from the Syrian battlefield is Russia's air campaign to prop up the regime of President Bashar Assad by attacking various rebel groups. These groups include the Islamic State almost as an afterthought, and Russia's aim is to construct durable air and naval facilities on the Mediterranean coast. Current counter-radicalization approaches lack the mainly positive, empowering appeal and sweep of the Islamic State’s story of the world, while at the same time lacking the personalized and intimate approach to individuals. The Russian supported government forces went on the offensive in October and for a week or so seemed to make some progress. The Russian air strikes, guided by Syrian ground controllers, were accurate and allowed the Syrian/Lebanese/Iranian forces to advance. But by mid-October the advance had stalled. There were several reasons for this. First, the rebels were suddenly getting a lot more recruits as many Syrians who were not keen on fighting other Syrians were very eager to “fight the Russians.” Even though there were no (or very few) Russian troops on the ground involved in these operations there were a lot of foreign fighters (mostly recruited, trained, armed and managed by Iran). These included Lebanese from Hezbollah plus Iraqi, Iranian, Afghan and other Shia persuaded (by Iranian cash and other favors) to volunteer for dangerous duty in Shia militias. There were Russians fighting FOR the rebels, but these were mostly Chechens working for ISIL. The rebels quickly adapted to the Russian tactics by retreating from areas to be bombed and falling back when the Syrian ground forces advanced. Then the rebels came back at night to often regain what had been lost the previous day. This tactic was helped by the sudden arrival of additional TOW anti-tank missiles. These first showed up in early 2014 used by some of the more moderate rebels. Such American arms aid has long been limited because of fears that high-tech weapons would fall into the hands of Islamic terrorist groups and later be used for terror attacks against Westerners. With the arrival of the Russians the U.S. shipped lots (more than a hundred) TOW missiles and this led to the advancing Syrian forces losing up to ten armored vehicles a day. Some of these TOW missiles were delivered by air drop to rebel units in the way of the Syrian advance. Other types of ammunition were also air dropped. Because of a prior arrangement Russian aircraft or anti-aircraft systems did not fire on the U.S. transports. 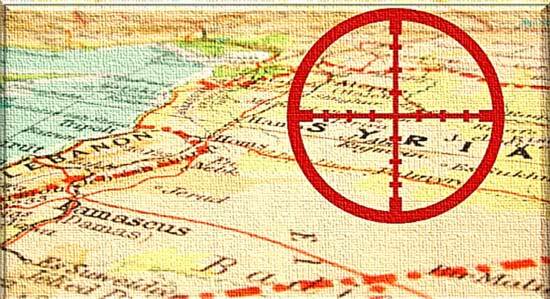 Russian Intervention in Syria: Just Putin’s Machismo? There are numerous examples that highlight the manner in which President Vladimir Putin, the former KGB spy and Russia’s nationalist leader, revels in his machismo. It could be his shirtless horse ride one day or shooting a Siberian Tiger the next, or for that matter, annexing Crimea and invading Eastern Ukraine. In fact the German Chancellor, Angela Merkel, once remarked to the media in 2007 that “I understand why he has to do this-to prove he’s a man, he’s afraid of his own weakness. Russia has nothing, no successful politics or economy. All they have is this.” This after, Putin called his pet dog into the room when she visited his home, despite being aware that she was terrified of dogs after having been bitten by one a decade earlier. …to believe that the Russian intervention in Syria stems from this machismo or is an attempt to return to the glory days of Soviet imperialism, as some, especially in the West, have suggested, would be a grievous error of judgment. Aleksander Wat’s life and work stand as warning that the totalitarian temptations of the 20th century have yet to run their course. There are so many different views of America overseas that any effort to generalize is dangerous, and at least partially misleading. It would be equally dangerous, however, to ignore the growing level of criticism of U.S. strategy, the degree to which Russia and other critics of the United States have made gains at the expense of the United States, and the extent to which both the Bush and Obama Administrations have contributed to a steadily more negative view of U.S. power, influence, and competence. Americans are used to listening largely to themselves, and to American criticism of America. It is a long way from the Arab (Persian) Gulf to Beijing, and stopping off to listen to Afghan and Pakistani voices is difficult and inconvenient. Most of the outside criticism Americans hear comes from Europe and is based on a shared set of political values even when they are most critical. Many allied countries outside America - like Japan - need the United States too much to be openly critical at an official level. The developing world has very different regional and national priorities. There is no one voice within — much less between — Latin America, Africa, the Middle East, and Asia. Lessons Encountered: Learning from the Long War began as two questions from General Martin E. Dempsey, 18th Chairman of the Joint Chiefs of Staff: What were the costs and benefits of the campaigns in Iraq and Afghanistan, and what were the strategic lessons of these campaigns? The Institute for National Strategic Studies at the National Defense University was tasked to answer these questions. The editors composed a volume that assesses the war and analyzes the costs, using the Institute’s considerable in-house talent and the dedication of the NDU Press team. The audience for this volume is senior officers, their staffs, and the students in joint professional military education courses—the future leaders of the Armed Forces. Other national security professionals should find it of great value as well. The volume begins with an introduction that addresses the difficulty of learning strategic lessons and a preview of the major lessons identified in the study. It then moves on to an analysis of the campaigns in Afghanistan and Iraq from their initiation to the onset of the U.S. Surges. The study then turns to the Surges themselves as tests of assessment and adaptation. The next part focuses on decisionmaking, implementation, and unity of effort. The volume then turns to the all-important issue of raising and mentoring indigenous security forces, the basis for the U.S. exit strategy in both campaigns. Capping the study is a chapter on legal issues that range from detention to the use of unmanned aerial vehicles. The final chapter analyzes costs and benefits, dissects decisionmaking in both campaigns, and summarizes the lessons encountered. Supporting the volume are three annexes: one on the human and financial costs of the Long War and two detailed timelines for histories of Afghanistan and Iraq and the U.S. campaigns in those countries. Travers McLeod offers a detailed account of the evolution of US counterinsurgency (COIN) doctrine since 2005 in Rule of Law in War: International Law and United States Counterinsurgency in Iraq and Afghanistan. While unconvinced that the shift has fully translated into change on the ground,Marika Sosnowski welcomes McLeod’s work as a valuable documentation of the significant transformation in the US approach to counterinsurgency. 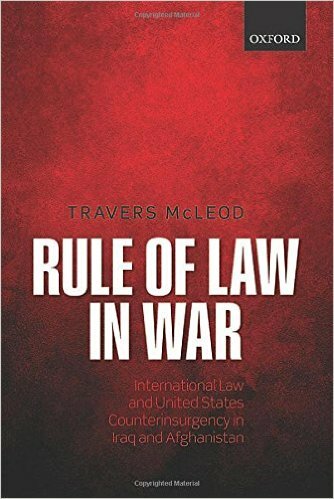 Rule of Law in War: International Law and United States Counterinsurgency in Iraq and Afghanistan. Travers McLeod. Oxford University Press. 2015. On the 14th anniversary of the September 11 attacks on the United States by al-Qaeda, Travers McLeod’s book, Rule of Law in War: International Law and United States Counterinsurgency in Iraq and Afghanistan, makes for timely reading. The book details the momentous shift that occurred in the way that the US approached counterinsurgency through the drafting and publication of Field Manual 3-24 (FM 3-24). It also attempts to evaluate the extent to which international law influenced the evolution of US counterinsurgency doctrine, which began around 2005 in response to the abject failures that the interventions in Iraq and Afghanistan had become. The Use of Minimal Force; Painful Myth or Useful Reality? Firstly, this essay will discuss the views of Thomas Mockaitis and Rod Thornton who believed that British counterinsurgency evolved around a set of general principles (one of which being the minimum use of force), which led to the development of a particular approach to COIN differing from the efforts made by other nations such as France and the United States. Subsequently, the essay will discuss the arguments made by Hugh Bennett, Andrew Mumford and Simeon Shoul, who perceive the principle of minimum use of force as something that may have been adhered to in theory, but was not always practiced in the field. Members of the cyber intelligence team set up to support a mission. 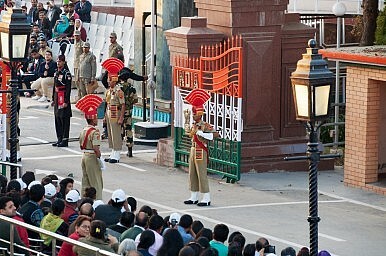 As cyber operations become more of a presence on the battlefield, so, too, will cyber warriors. At an exercise last week at Joint Base Lewis-McChord, Wash., the Army offered one version of what they would look like. Basically, they’d look like other soldiers on a mission—full camouflage, weapons and equipment in tow, crawling through the brush to stay out of sight. After setting up their computers and equipment, the cyber and intelligence team provided real-time intelligence to a brigade combat team whose mission was to find and capture a high-value target hiding in a crowded, multi-building compound. "The cyber element was able to provide intelligence to myself on the ground that enhanced [intelligence] information that made the picture of the battlefield much more clear," 1st Lt. Kenneth Medina, who led the mission, said in an Army release. "When you incorporate cyber into that you gain a much higher degree of accuracy on the target and you can paint a much clearer picture of the objective area." Russians submarines and spy ships are “aggressively operating” near the undersea cables that are the backbone of the global Internet — worrying some U.S. intelligence and military officials who fear the Russians may sabotage them if a conflict arises, the New York Times reports. For all the talk about the “cloud,” practically all of the data shooting around the world actually relies on a series of tubes to get around – a massive system of fiber-optic cables lying deep underneath the oceans. As the Senate finally prepares to vote on the Cybersecurity Information Sharing Act (CISA) legislation, it is important to keep in mind that CISA alone will not solve our problems with respect to cyberspace. A much broader strategy is needed. America is largely responsible for today's Internet which, after creating enormous prosperity and human progress, is now being used to recruit terrorists, oppress freedom, harm our economy and threaten our national security. If we are to continue to enjoy the web's blessings, we will need to develop and execute a comprehensive strategy to deal with those who would threaten us in the cyber domain, just as we did in previous ages when our well-being was threatened on land, at sea, and later in the air and in space. Adm. Michael Rogers on how long before there’s a digital Pearl Harbor in the U.S.
As director of the National Security Agency, Adm. Michael Rogers is on the front lines of U.S. efforts to thwart cyberwarfare and cybercrime. Adm. Rogers sat down with Dennis K. Berman, the financial editor of The Wall Street Journal, to talk about the cyberthreats that concern him most and efforts by tech firms such as Apple Inc. to build products that protect user data from law enforcement. BERMAN: So how long until we have a digital Pearl Harbor here in the U.S.? ADM. ROGERS: It is only a matter of when before someone uses cyber as a tool to do damage to critical infrastructure within our nation. I’m watching nation states, groups within some of that infrastructure. At the moment they seem to be focused on reconnaissance, but it’s only a matter of time until someone actually does something destructive. The second trend that concerns me, historically to date we’ve largely been focused on the extraction of data and insights, whether it be for intellectual property for commercial or criminal advantage. But what happens when suddenly our data is manipulated, and you no longer can believe what you’re physically seeing? The United States is facing an unprecedented challenge in countering the propaganda of adversaries who recruit and easily spread misinformation through the Internet, a top defense official told a House panel yesterday. While there are many benefits to being in a cyber-connected world, there is also a "dark side" that adversaries are taking advantage of, according to Michael D. Lumpkin, the assistant secretary of defense for special operations and low-intensity conflict. "The scope of our current challenge in the informational space is unprecedented," Lumpkin told the House Armed Services Emerging Threats and Capabilities Subcommittee. Joining Lumpkin at the hearing were Army Maj. Gen. Christopher K. Haas, director of the force management and development directorate for U.S. Special Operations Command, and Air Force Brig. Gen. Charles Moore, deputy director for global operations on the Joint Staff. The Arab War on Terror is in full swing. Never has the region seen as many terrorist networks, guerrilla groups and militias fighting against governments as now. In Egypt, Iraq, Algeria and Yemen, central governments are struggling with insurgencies of one type or another, with Western governments providing tacit or overt support. Unfortunately, counterinsurgency is a difficult business for Arab states – for all states for that matter. Egypt’s Sinai campaign is now in its fourth year; Yemen’s Houthis have come back with a vengeance after a decade in which six military campaigns were run against them; Algeria fought an outright war against Islamist networks in the 1990s but low levels of terrorism have persisted since then and are now on the rise. Years of training and $25 billion in aid failed to produce an Iraqi security force capable of eradicating, or even containing, a proto-state organisation like ISIS. The Libyan and Syrian forces did not manage to put down the uprisings they were supposed to quell. So why is it that counterinsurgency does not come easily to regimes in the Middle East and North Africa? Task Force Smith was the first U.S. combat force sent into Korea in June 1950. Instead of intimidating the North Korean foe, they were easily overrun. They proved ill-equipped and ill-prepared as a result of many bad decisions concerning force readiness made during the previous five years. Since that time, that unfortunate unit has become the Army’s metaphor for lost readiness. That same Army of 1950 also lacked sufficient capacity in its higher headquarters to provide direction and synchronize combat efforts and worldwide commitments. When North Korea attacked, the U.S. Army maintained only one corps headquarters, prompting Gen. Douglas MacArthur to request two more corps headquarters a month later. V Corps was brought up to strength, re-designated as I Corps, and sent to the Pusan perimeter, followed shortly by a new IX Corps formed by cadre from 5th Army. In addition, for the invasion of Inchon, MacArthur formed and activated X Corps from his own Far East Command staff. Ultimately, by the summer of 1951, the Army had grown from one to eight corps headquarters with four in the Far East and two in Germany. The U.S. Air Force is presently debating the idea of enlisted pilots for Remotely Piloted Aircraft (RPAs, or what most of you call drones). The continuing demand for more RPA flyers, and our continuing inability to retain current RPA flyers, has precipitated a manning crisis, and this idea seems to provide a way out. I fundamentally disagree with this idea, not because I doubt the quality of our enlisted force, but rather because I wholeheartedly believe in it. I disagree with the idea because I believe in the principle of equal pay for equal work. We have many amazing enlisted airmen that will some day make great pilots. It would be an insult to these airmen to ask them to do the work of a lieutenant or a captain, with the exact same responsibility and personal liability, while denying them the rank, authority, and benefits that come with that responsibility. We already have a highly successful and very popular road to make enlisted airmen into pilots: It’s called Officer Training School (OTS). Instead of using enlisted pilots, there should be a broader OTS option for RPA sensor operators, with a streamlined selection process delegated to wing commanders. OTS has given our community many of our best flyers and our best leaders, and we desperately need more of both.